"Treat your lips to glistening, juiced-up colour and help a great cause too! $5.00 from your purchase helps support The National Breast Cancer Foundation. 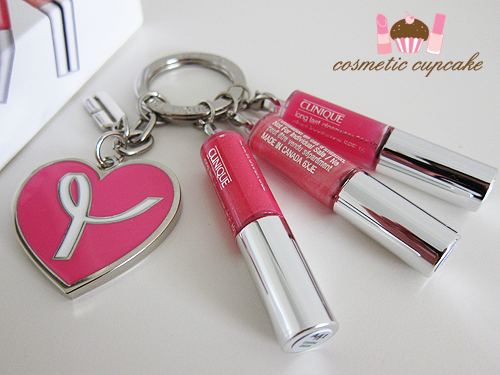 Our limited-edition Long Last Glosswear SPF15 trio of minis in Air Kiss, Clearly Pink and Cabana Crush 1ml on a keychain come with a Breast Cancer Awareness Pink Ribbon Key ring." 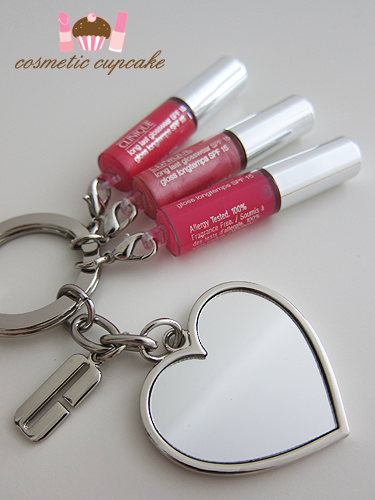 The key ring features a pink heart shaped ribbon charm that is a mirror on the reverse side, a Clinique "C" charm and three mini-Long Last Glosswear SPF 15 glosses. It's a VERY sturdy key ring and I nearly broke a few fingernails trying to get my keys on it! The three mini Long Last Glosswear SPF 15 are Clearly Pink, Air Kiss and Cabana Crush. These colours are permanent colours in the Long Last Glosswear SPF 15 range and are very flattering shades. From top - bottom: Clinique Clearly Pink, Air Kiss and Cabana Crush. Cabana Crush is a medium pink with gorgeous gold shimmer through it; Air Kiss is a pretty peachy pink with subtle shimmer and an old favourite of mine - it was one of my very first Clinique glosses I owned many years ago! - and Clearly Pink is a clear light pink gloss. From L - R: Clinique Cabana Crush, Air Kiss and Clearly Pink. Overall: I love this cute key ring! I never have to worry about being without lip products when I'm out and about again which is great! The Long Last Glosswears are somewhat sticky in texture but are SUPER glossy which is what I like about them. They wear for a considerable time on me also. The colours they've included in this trio are very flattering and girlie too! Details: Clinique will donate $5 per product from the sale of each Clinique Great lips, Great cause Mini Long Last Glosswear SPF 15 to the National Breast Cancer Foundation. It is available exclusively online from www.clinique.com.au for a limited time for $35. Unfortunately I believe it's no longer available (oh the downfall of LE products doh!) but you can win your very own in my Pink for October giveaway here along with other pink products! 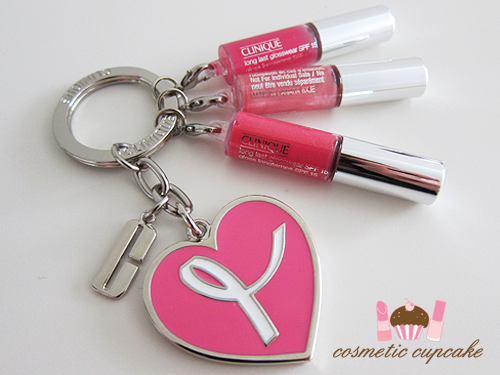 For more Breast Cancer Awareness products for 2011 check out my post here. Have you tried the Clinique Long Last Glosswears? What do you think? Thanks for looking as always ladies! 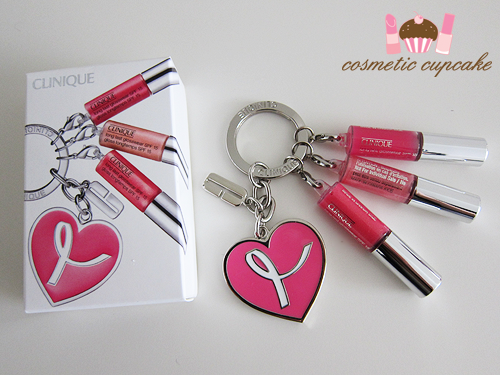 These lippies are so versatile, I'll have to find a way to own this keyring! Too cute. Ooh, it's so pretty.... I don't even wear gloss that often, but this is so shiny and pretty I really want it. @Iantha: I was so lucky I purchased it when I did! I think it was sold out the next day. Maybe try eBay?? @S.N. 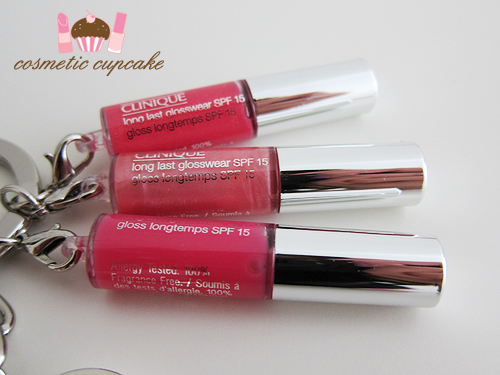 : The Long Last Glosswears are wonderful glosses and I highly recommend them! @Donna: Hey Donna! Glad to hear you love on the go products too =D small sized products are just TOO CUTE in my opinion haha. LOL I'll probably end up doing that too! I want to use up the glosses but then I don't for that reason! @Muriomu: I think it's an ingenious idea too. Perfect for busy girls who love glam! Thank you for taking the time to stop by and comment! I love reading your feedback and suggestions and truly appreciate each and every comment. I try to respond to all my questions as soon as I can in the comments so make sure to check back later. PLEASE DO NOT POST LINKS. I'm a 20 something Registered Nurse who loves nail polish, makeup, fashion, shopping and good food! Pink for October 2011 giveaway! Do you love cosmetics? Then you'll love Apothica who carry a huge range of products including Smashbox makeup! Check out their huge range. without written permission from Cosmetic Cupkake.